In Russia in the 1920s and 1930s if you wanted to send stamps abroad (or get stamps from abroad), you had to send your letter via the Soviet Philatelic Association. You had to declare the value of the material you sent (the Yvert et Tellier catalogue was used; perhaps it was reliable then), and you paid a tax on the value. Your letter was sealed up with a Philatelic Exchange Tax stamp for the amount of tax you had paid. It is my belief that the Philatelic Exchange control stamps are never used philatelically - that is to say, no one ever paid more tax than necessary just to get more Philatelic Exchange tax stamps on the back of the envelope. Maybe it was not even possible to do this. 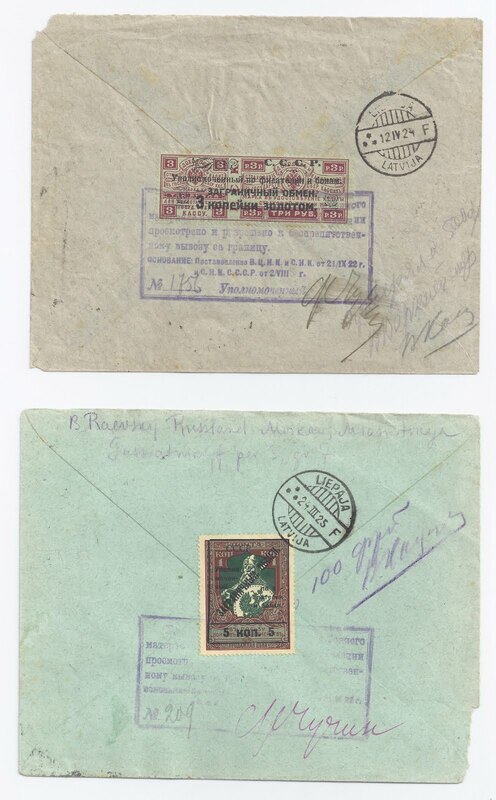 In general, it is low value tax stamps which are seen - few collectors were rich enough to send high-value material. The high value Exchange Control stamps are more common mint than used. The reverse is true for low values. It is clear that by the 1930s most collectors were afraid to send mail abroad - it put you at risk of attention from the secret police. Indeed, when the Soviet Union occupied the Baltic States in 1940, stamp collectors and dealers with foreign contacts were high on the NKVD list of people to be interrogated. So in the 1930s, most mail with Philatelic Exchange Control stamps is sent from the Soviet Philatelic Association itself. 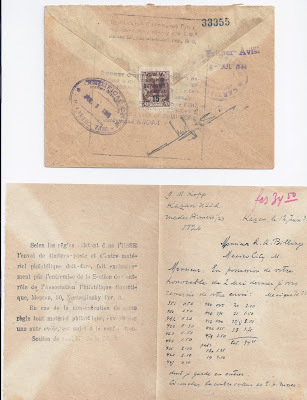 The 1933 cover above, going to Mexico, and still with its contents letter is an unusual example of a sending from a private individual. 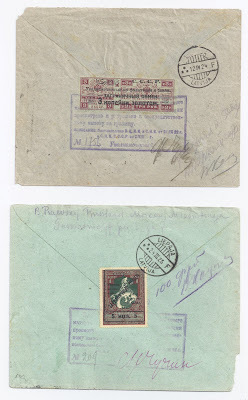 In the early 1920s, you can find covers with the autograph of F. Chuchin, the first Soviet "Commissar for Philately" and author of the famous Chuchin Zemstvo catalogue. Two examples of autographed covers are shown at the top of this Blog. In both cases, you can see manuscript indications of the value of the sending expressed in Francs (500 and 100). 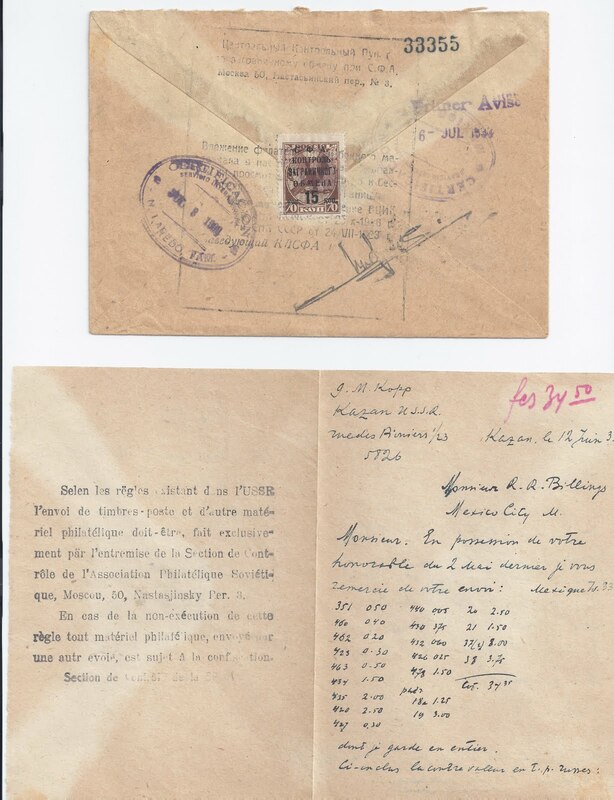 In the case of the sending to Mexico, the value is indicated in red on the accompanying letter (Fr 34.50)which also has a statement of the rules governing philatelic exchange printed in French.